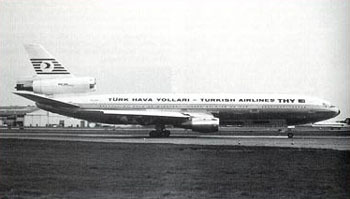 Turk Hava, Flight TK981, a McDonnell-Douglas DC 10-10, departed Orly Airport in Paris, France for London's Heathrow Airport. Approximately 10 minutes after takeoff, Flight TK981's radar signature was seen to split into two, with one part remaining stationary before disappearing from the radarscope. The second part turned left to a heading of 280 degrees. This second radar return was the separation of the cargo door, which occurred at a height of approximately 11,000 feet, at a point when the cabin pressure would have been roughly equal to that of sea level. The ejection in flight of the aft cargo door on the left-hand side was followed by a sudden depressurization which led to the disruption of the floor structure. It caused six passengers and parts of the aircraft to be ejected, rendering the number 2 engine inoperative and impairing the flight controls (tail surfaces) so that it was impossible for the crew to regain control of the aircraft. Seventy-seven seconds later, the airplane crashed in the forest 37 km northeast of Paris. The Investigation Commission determined that the accident was the result of the in-flight ejection of the aft cargo door on the left-hand side. The sudden depressurization that followed led to the disruption of the floor structure, impairing the flight controls so that it was impossible for the crew to regain control of the aircraft. The underlying factor in the sequence of events leading to the accident was the incorrect engagement of the door latching mechanism before takeoff, made possible by the characteristics of its design.